I have now changed how I brew kombucha. I used to use an 8 quart enameled Le Creuset stockpot on my gas stove. To cool it down from boiling to 80F, I would fill my kitchen sink with ice water and let it sit. This takes a while and all of the ice in my freezer. I looked at Academy for outdoor propane burners. But they were incredibly flimsy. Sigh. People buy such cheap crap. 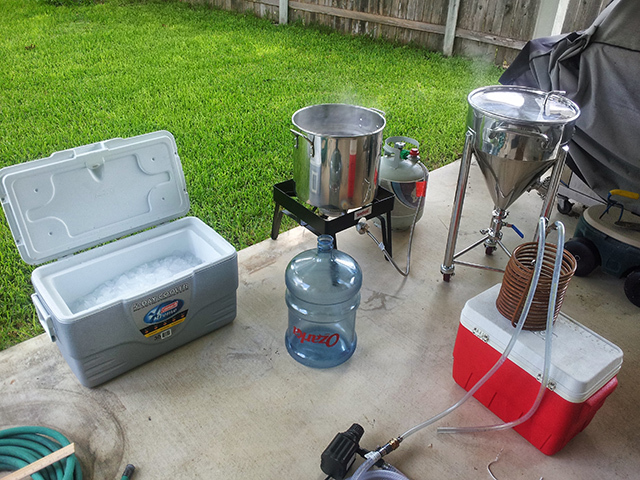 Fortunately, Austin Homebrew had a Bayou Classic Outdoor Propane Burner which was pretty solidly made from cast iron. The next step was to use my 36 quart Coleman ice chest. I can just barely fit two 16 pound bags of ice for $3.00 in my corner Ice House America. 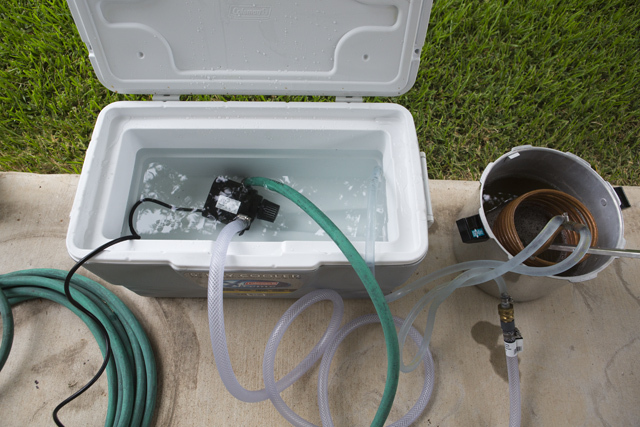 I then bought a pool pump from Home Depot and a hose to connect to a BrewVint Wort Chiller (30 ft) on loan from Ryan (NOTE: I don’t think this is an exact match). The next step was to buy a large kettle. 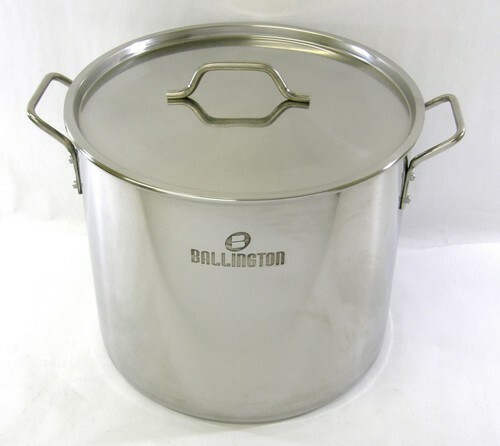 I went with 40 quart (10 gallon) Stainless Steel Stock Pot Steamer Brew Kettle w/lid BA76-40 from eBay for $76. I now buy 5 gallons of reverse osmosis water from Glacier Water Dispenser next to my Super HEB. This entry was posted in Kombucha on July 28, 2013 by Mark. 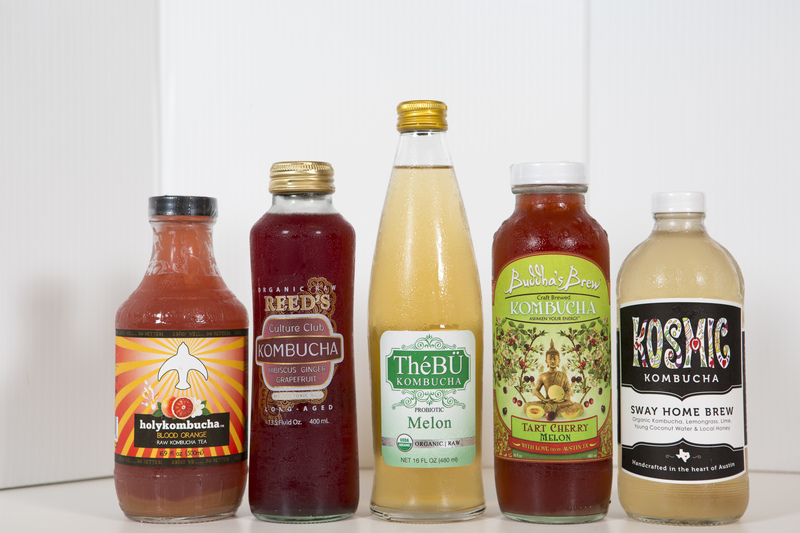 So, kombucha seems to be hot right now. There are a lot of new brands out there. So I decided to buy a bunch and have a taste test. 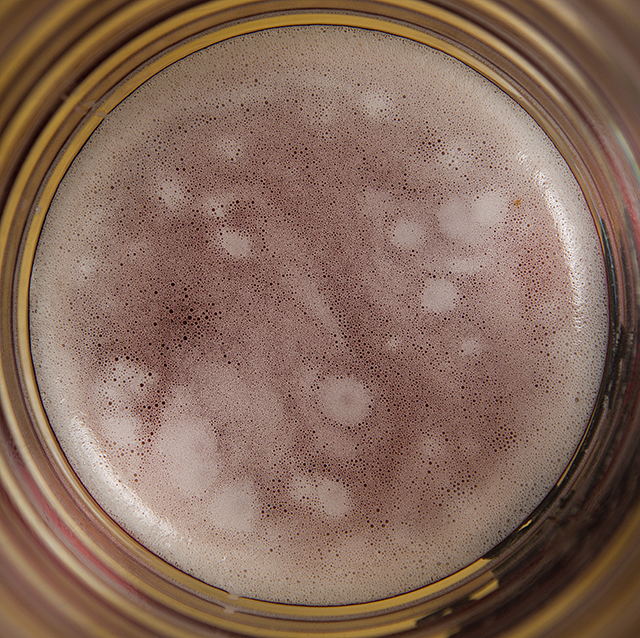 Kosmic Kombucha / Stay Home Brew – A little sweet. Cannot taste the kombucha at all. 7g sugar/serving. 100 Calories/18 oz. ThéBÜ Kombucha / Melon – A little sweet. Cannot taste the kombucha at all. 56 Calories/16oz. Reed’s Culture Club Kombucha / Hibiscus Ginger Grapfruit – A little more sour with some sweetness. 50 Calories/13.5 oz. holykombucha / Blood Orange. Kombucha taste was muted. 60 Calories/16oz. Buddha’s Brew Kombuca / Tart Cherry Melon – Much more tart. You can taste the cherry and the melon. 112 Calories/16oz. My tastes lean towards sour and away from sweet. So Buddha’s Brew is still my favorite. This entry was posted in Kombucha on July 26, 2013 by Mark. This entry was posted in Kombucha on July 22, 2013 by Mark. While I have been trying to convince Ryan to buy a conical fermenter for some time now, I bought one before he did. It is kinda of a crazy jump up in equipment for me. But I need a new toy. The thing about kombucha is that the gelatinous scoby forms at the top of the liquid and covers the entire surface area. So if the vessel then constricts at the top, it is rather difficult to man handle around the scoby. Such as when you drain the kombucha, or when you remove the scoby. 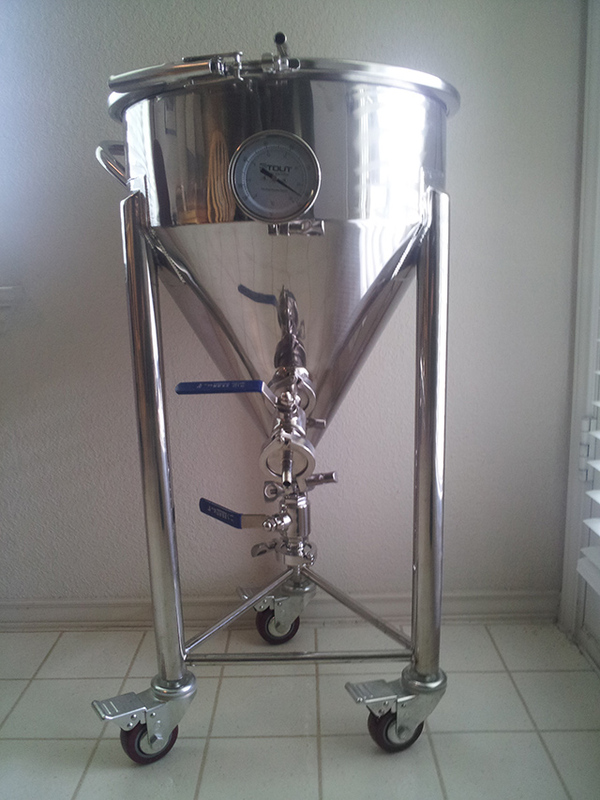 Blichmann sells a 7 gallon conical fermenter for $600. One weird thing is that the price does not scale up linearly as the volume increases. A 14 gallon fermenter is $640. I went for a cheaper version made by Stout Tanks (the 7.3 Gallon Conical Fermenter with wheels and thermometer for $479). The build quality is quite nice except for a couple of issues. The first major one is that the center of gravity is not in the middle of the three wheels. One of the three sides is off balance, where if you push it, the conical will tip over. This is not fun when it is full of liquid. The other problem is with the default sanitary ball valves. These are cheaply made and have slightly inconsistent dimensions of the wrench fittings. Also, the o-ring that they use have a major flaw in them. When you tighten the valve back up, the o-ring will squeeze out of the gap rather than stay against the side. This is incredibly frustrating during a brew day after I have broken down everything to clean it and then discover that it cannot hold liquid. Fortunately, Stout Tanks took them back and gave me the better butterfly valves. I tried experimenting by making a tomato pie of sorts. And learned that I still need a ways to go in removing the moisture from the tomatoes. I was hoping that the cornbread would serve as a good “crust,” but I think mine turned out too thick. This entry was posted in Cooking on July 20, 2013 by Mark.